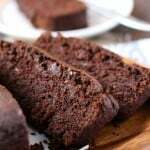 Home » Breakfast » Chocolate Banana Bread (Gluten Free, Vegan, Refined Sugar Free). Chocolate Banana Bread (Gluten Free, Vegan, Refined Sugar Free). Banana bread is one of our favorite things to bake at our house. It’s simple to make, most people love it, and it’s easy to make it gluten free or vegan. If we’re travelling, I’ll often bake banana muffins or banana bread to take along with us – it makes a great breakfast or snack for the road! This is a fun variation on the normal recipe, because it combines two delicious flavors – bananas and chocolate. You maybe surprised at how easy this chocolate banana bread is to make. Yes, even if you have multiple food allergies, you can still enjoy fresh baked banana bread that holds together well, looks good, and most importantly, tastes good. One of the secrets to this gluten free chocolate banana bread is to use very ripe bananas – I’m talking over ripe bananas that have been stashed in the freezer and are now extra sweet. They’ll give this bread great flavor and keep it tender and moist. <– Not a fan of that word, but it’s true. Another thing that helps this loaf turn out well is using a glass loaf pan lined with parchment paper. You won’t have trouble with this bread sticking if you use parchment paper. This type of loaf pan works really well (affiliate link). you can add coconut flakes or seeds or nuts to the batter if you wish – be creative! The other great thing about this recipe is that it’s a little bit healthier than your normal banana bread…it’s refined sugar free! Of course, if you don’t love coconut sugar, you can go ahead and use regular sugar or a blend of regular sugar and brown sugar. You could also add chocolate chips if you wish. If you aren’t gluten free, this recipe should work just fine with regular flour or spelt flour. This recipe will not work with coconut flour. 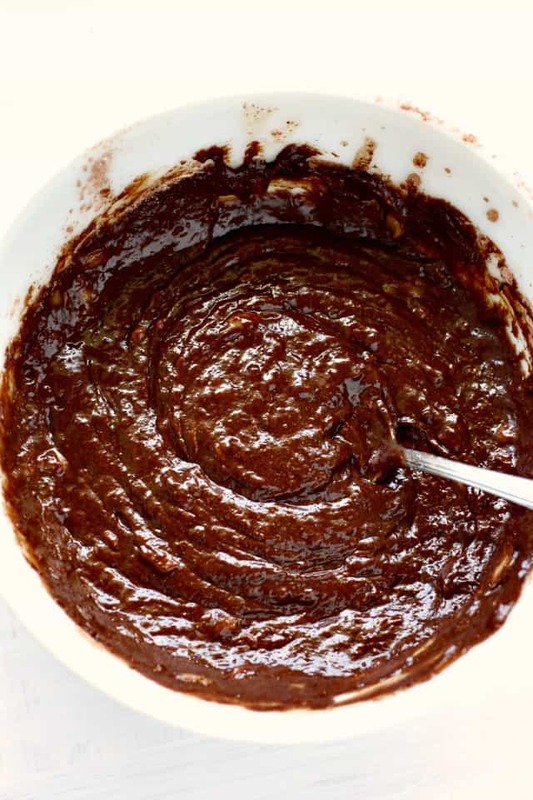 Just mix this batter in a bowl with a spoon – no electric mixer required! 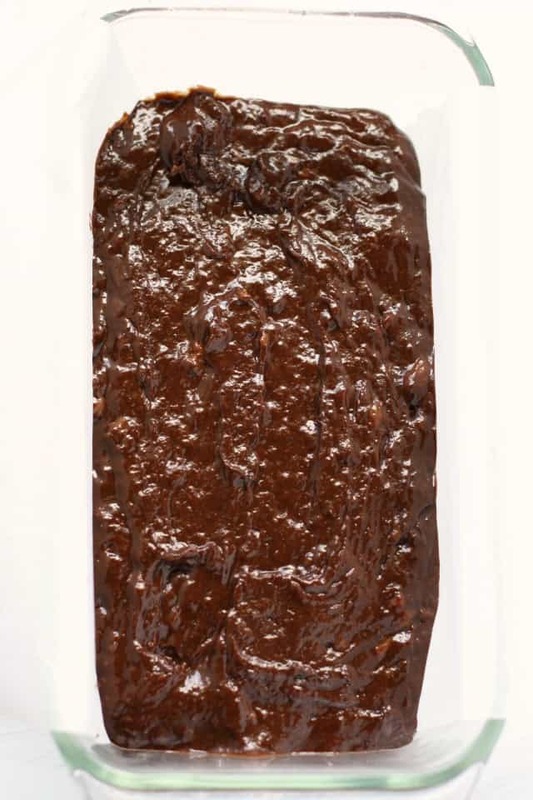 Spoon the chocolate batter into your prepared loaf pan, and bake. Less than an hour later, you’ll have a delicious loaf of chocolate banana bread! 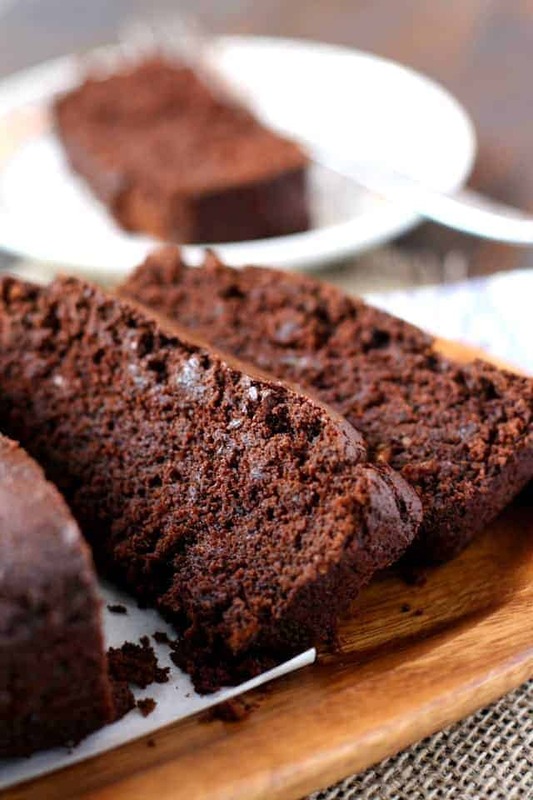 This gluten free chocolate banana bread is great for breakfast, a snack, or a healthier dessert. If for some reason you have a lot of leftovers, I think that it would freeze very well. 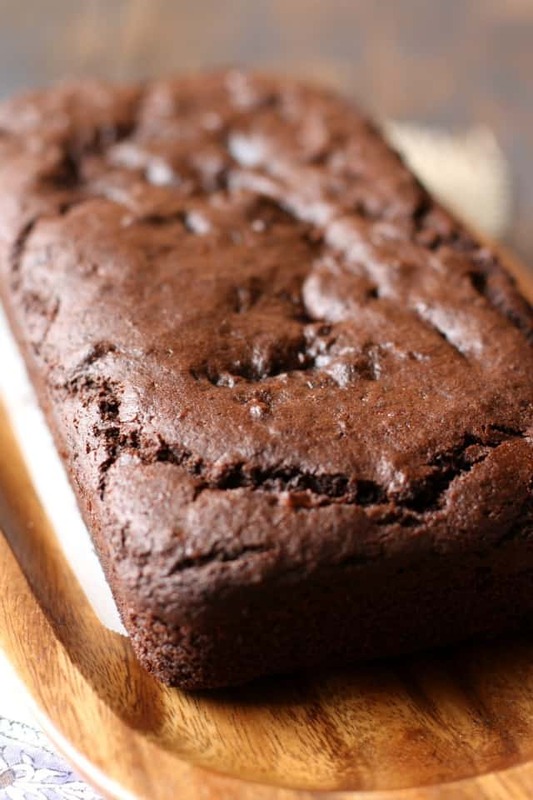 An easy recipe for chocolate banana bread that's gluten free, vegan, and refined sugar free. Preheat the oven to 350 degrees. Line a loaf pan with parchment paper so that there is an overhang on both sides. Place the bananas in a separate bowl and mash with a fork. Add the melted coconut oil, vanilla extract, apple cider vinegar, and water. Stir well. Pour the wet ingredients over the dry ingredients and stir until combined. Pour the batter into the prepared pan. Bake at 350 degrees for 40-45 minutes, or until a toothpick inserted in the middle comes out clean. Let cool completely in the pan before using the parchment paper to remove the loaf for slicing. *King Arthur Multi Purpose Flour works well, as do blends by Bob's Red Mill or NOW Foods. There, now you’ve got an easy recipe for the next time you’re overrun with brown bananas. Or am I the only one that has that problem? « Nut Free and Dairy Free Pesto. Just made this today into mini cupcakes (used only half the recipe) with just plain organic sprouted brown rice flour and no other gums.Amazing!!! My kids ate the whole 24 cupcakes in no time. I also used only 1/3 cup of the sugar,and it was still sweet enough. Will be making another batch in a few minutes. I just want to say that I am still making these for my kids, but I stopped using sugar altogether and the taste is amazing.You can add a few roasted nuts or chocolate chips and very ripe bananas. I double the vanilla as my kids are not banana fans.Great healthy treat for the kids. I don’t know if my first comment went through, so let me ask again. I love the taste and the top was good. But it would never cook all the way through. Any thoughts on what i may have done wrong? What type of flour did you use? Hi, i dont understand..i did exactly as written (and my bananas were superrr ripe) except i used coconut flour and it is so dry it looks like sand. Is it because of the flower? The other comments and pictures make it look so great that I would like to do it again but correctly. Coconut flour doesn’t work well unless there are eggs or a ton of liquid, becuase it just soaks up all the moisture. A gluten free flour blend like King Arthur or Bob’s Red Mill will work. I write to you with a sad face. I followed this recipe but the cake didnt turn out to be anything like your pictures. In fact, when i cut them in squares, the top and bottom had a sponge cake like feel but the middle just looked like fudge brownies :( Im so disappointed in myself. I’m sorry to hear that! What gluten free flour did you use? What size pan? Thanks for the recipe. This is the first time I baked with coconut sugar and am glad I did! It turned out to be so tasty. I followed your recipe totally, it tastes amazing! Just one question how would you store this bread? Refrigerate or at room temperature? Yay, so glad you liked it! Thanks for letting me know! I would store it at room temperatre in an airtight container. I made this for Bible study. But I replaced the cacoa powder with Carob powder. I also don’t use baking soda I just put aluminum free baking powder. It taste great. And my 8 years old the one who made this. Glad you enjoyed it, thank you for letting me know! Have you tried using honey instead of the coconut sugar? I also was wondering if this substitution would work?! I have never tried it, but my guess is that the batter would be very wet, and I don’t know what the texture of the loaf would be. I completely replaced the sugar with agave nectar. 3/4 cup of it seems to be the right amount. You can do 1/2 a cup and still taste good. I have done your banana bread so many times! I top it with chia, oatmeal, pecans, and flax! Thank you for this recipe! I was thinking to make this recipe for a birthday cake ^ ^ and top it with some vegan ice cream or chocolate ganache. Would it work as a cake? Any tips for a vegan rookie? Hahahaha thanks! Yes, I definitely think it would work as a cake! Depending on the size of the pan, it may take less time to bake, so just keep an eye on it. Just wanted to thank you for this recipe. It’s my go to recipe now to cater for those that have allergies. It’s just so moist and delicious! I love it! And yep, we always have bananas that have gone too brown. ? We keep a banana jar in the freezer and use them from there. I have a K.A.F. Gluten free flour blend I’d like to use with this recipe, however, it doesn’t have any Xanthan gum in it. I’ve noticed many of these recipes don’t call for it in them. Maybe you can explain this to me. I have not had any issue with things holding together when using the KAF blend with no xantham gum. It seems like the gums are what make some GF goods dense and heavy. Just an observation after using that blend for a long time. Amazingly surprised at how moist and decadent this bread is! So very delicious! That looks amazing! What could you use instead of the vinegar? Hello is it possible to use oat flour / chick pea flour instead of the gluten free flour? I dont have any gluten free flour and it’s difficult for me to purchase it on a student budget. You can try it but it may be a bit denser. So glad you liked it, your changes sound good! This was scrumptious! Thank you. The only strange thing was that I doubled the recipe and that made only one loaf. Maybe the tin I used is large. Hi.Good day.Am a mother of 4y.o just a month ago when we found out thru allergic test that my daughter was allergy to wheat,milk,soya&egg white.Some fruits also if were given like mango,grapes,strawberries.We feel so much sorry to her coz all d food mostly she like before suddenly not allowed to her.Esp the milk that she used to drink before goin in bed now not allowed.We tried to give alternative like coconut with rice but it was only refreshing juice but since am here in saudi am having hard time to dind the product.Can you please help me some recipe in cake that easy to cook & ingredient that can be found in kitchen.shes goin to school soon i need it badly in preparation.Only your receipe i saw gluten,egg free.dairy free.Give me aome advise that will help.us a lot.By the way am a filipino.Your reaponse will appreciate. I’m so sorry, I know how hard it is to manage multiple food allergies! 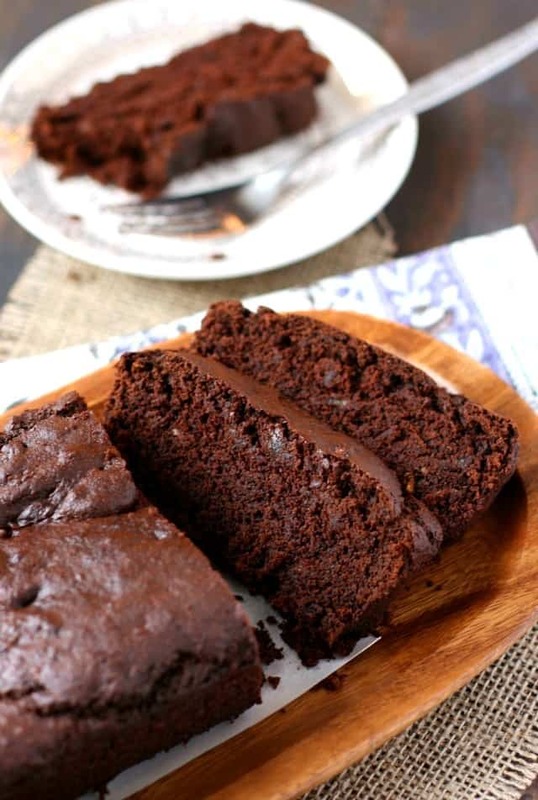 This recipe is pretty easy – http://theprettybee.com/2013/10/easiest-gluten-free-vegan-chocolate-cake.html I hope that helps! I made this today and it is incredible! Instead of the 1 cup coconut sugar, I used 1/2 C packed brown sugar + 1 Tbsp maple sugar and it was perfectly sweet. I also added 1/2 tsp cinnamon. 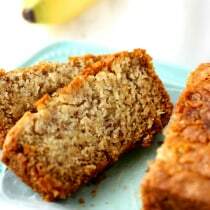 I just want to tell you all that I tried this banana bread tonight and it doesn’t disappoint! I made it with 4 bananas (smallish frozen ones) instead of 2 because I wanted to add some sweetness and I used oat flour instead of a GF blend and it worked great! I also baked it in a pie pan (with parchment) as I don’t own a loaf pan and it baked for about 25ish minutes and looks SO GOOD. Thanks for a great recipe! So glad it worked for you! Thanks for letting me know! I have made this several times and I love it. I’ll admit that I did use frozen bananas, but it turned out fine. Also, for effect I used about half the cocoa and swirled it in. This recipe sounds divine. I just put mine in the oven in a muffin tray (don’t have a loaf tin – still building our kitchen supplies up haha). I added 1/4 cup of dairy free choc chips because I couldn’t resist a little extra decadence. You could try almond flour, but it will probably make the bread dense. Coconut flour is very hard to work with without using an egg. This looks so good! Just one question – do you use refined or unrefined coconut oil? Thanks! You can use either based on your flavor preference! I use unrefined. Oh man, this looked so good that I decided I had to make it. It’s in the oven now. Can’t wait to try it! I made this recipe earlier today – into muffins – and just tasted one to make sure they would be good enough to give as a birthday gift for my brother and now i can’t stop eating them! Their texture is just like that of regular muffins. They are moist and have no hint that there’s no gluten or eggs in them! I’m so glad i stumbled on this recipe after years of baking gf/df/ef, it’s nice to find a recipe that is easy and tastes delicious. thanks! Could these be made as muffins instead? Do you know how to alter the cook time? I think that would work fine, just start out with about 12-15 minutes and watch them. This recipe is amazing. I put the batter in miniature Muffin tin pan. And they came out like little cupcakes. I found that the batter very dry when I was mixing it up. So I added a couple table soon fulls of coconut milk. And the end result was super moist and totally amazing little miniature muffins. You’ll never know or suspect how healthy these really are. My 3 year old gobbled them right up. I have saved this recipe to my favorites file on pintrest. Thank you. Yay, sounds so good! I love those variations! Thanks for sharing! I’m not sure if you mean oat flour? If so, that may work, but I haven’t tried it! So glad it works for you! Thanks for letting me know! Hi there! I tried this recipe using whole wheat flour and brown sugar because that was what I had, and turned out beautifully. Thanks for the recipe! Yay! So glad you liked it! Thanks for letting me know! Can’t wait to make this delicious looking banana bread! Since bananas vary widely in size, could you give me an idea of the amount (cupwise) of mashed bananas you used. Thanks. I really haven’t measured it! I just use medium large size bananas. If your mixture seems too wet or dry, just add a little more flour or liquid. made this and it taste amazing and looks sooo good. I added peppermint to mine tho but it is still amazing!! Can I substitute coconut flour for the gluten free blend? If so, would it be a different amount? You would probably need to add more liquid. I’m not sure how it would turn out. What is coconut sugar, and where can I buy it in the uk please. Coconut sugar is a sugar that is from coconuts. I would check Amazon. If you can’t get it, you could use any sugar in its place. I just made this today and I have to say it was one of the best g.free breads I’ve ever made, it is very moist and fudgy. I baked it in a 4.5 x 8.5 loaf pan instead of the larger size, it fit perfectly and baked beautifully. Next time I will add some chopped walnuts for added crunch and nutrition. Great recipe. I only had half the gluten free flour so used coconut flour to make up the rest. Otherwise, followed the recipe and it turned out great. Absolutely delicious! So glad you liked it, thanks for letting me know! Thanks for the recipe! Everyone loved it. I used all-purpose flour instead of gluten-free and a teaspoon of lemon juice because I didn’t have apple cider vinegar but it was still perfect! So happy everyone loved it! Thanks for letting me know! Thank you so much for sharing this perfect recipe! I was up last night and couldn’t go to sleep, so I decided to try out this recipe. I didn’t have coconut sugar so I used date sugar which worked perfectly. I used Bob’s Red Mill 1 to 1 gluten-free flour. It turned out so perfect!!! I still can’t believe it! And keep in mind I’m not an experienced baker at all!! Love this!!! I’ve just baked your recipe. The batter was too thick and I think the recipe needs more liquid. Melted coconut oil, water and vinegar were not enough to moist the flour and coconut. I actually baked them in little silicone muffin cups to give my kids as snack at school. Because the batter was not runny enough, mini cake muffins baked in weird shapes. Taste is wonderful though. Even though I used half the coconut sugar, they taste divine. Next time I’ll try adding coconut milk. Allergic to coconut also,can I use regular sugar and oil? Ugh I need that loaf in my face asap! I love that you use coconut oil and coconut sugar – I have everything I need to bake it already! I can taste the chocolatey banana flavor through the screen and I’d definitely eat slice after slice! Not that I’m complaining. Banana baked goods are a-okay with me! I know, we always have tons of brown bananas! I hope you love this! Yes Please! The only thing better than banana bread is when you add chocolate to it!